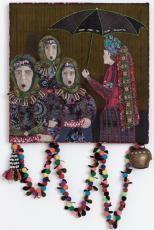 Trained as a textile artist (Goldsmith's 1986) the work explores memory and story-telling. The darker tones on experience are married with a delight in the every-day. Poetry is a key inspiration, along with Greek mythology, folklore (particularly Eastern Europe) and the landscape of southern Spain - where most recent work is made. Indigo-dyed fabric and paper are the basis of much of the work, which is collaged, stitched and sometimes printed on. The pieces are worked on over months: taken apart, re-structured and re-sewn, left out in the sun, wind and rain. Paints, indigo, olive oil and bleach are used in the work which includes favourite motifs: magpies, red shoes, arches. Having worked with indigo for the past 18 years, the magic of this ancient dye endures, recently using "un-picked" Chinese skirt fabric dyed and burnished with indigo. The work is in private and public collections throughout the UK, Ireland, Germany and America.